INDUSTRY.co.id - Bekasi - Apartment with the concept of Smart Living in Urban City is present in Bekasi City. The project named Midpoint Residence is located on the border of the arches of North Jakarta & East Jakarta. Precisely near the door of Kota Harapan Indah Bekasi. Therefore, although entered in the area of ​​Bekasi City, the position of an apartment located close to the industrial area is quite strategic in supporting the mobility of its inhabitants. 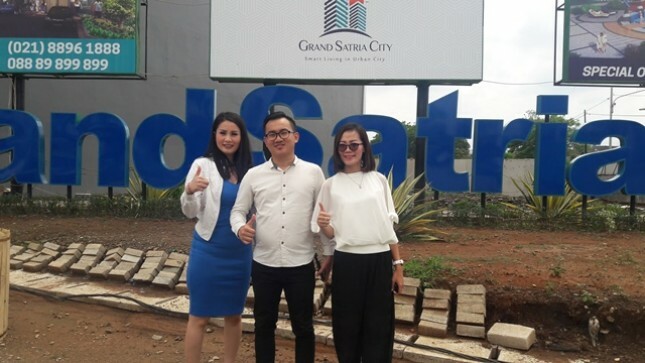 Rizzky Pratama as Projecy Sales & Marketing Advisor Grand Satria City as Midpoint Residence developer says, Midpoint Residence provides supporting facilities for daily activities for Young and Millennial Executive. "The occupants will only take about 10 minutes to access the Cakung Barat toll road, if you want to enter the toll gate Bekasi Barat only takes about 15 minutes. In addition, if you want to ride other transportation such as KRL, you only take it with 5 minutes to arrive at Kranji station and only 10 minutes to arrive at Bekasi Station. Meanwhile, for Busway or Trans Jabodetabek users, it only takes 3 minutes to get to the bus stop, "he said during Media Gathering event at the apartment project location on Tuesday (12/12/2017). In addition to the location, the selling point of the project that will stand on the 1.6 hectare land is PTPP (Persero) which will act as the main contractor of the project. This State-Owned Enterprise is chosen because the developer considers PTPP to be reputable and highly skilled in working on high-rise buildings. "Everyone knows the projects that PTPP is working on have good building quality," Rizzky said. Rizzky said, at Midpoint Residence it allocates 80% of the units in the studio type, the remaining 20% ​​two-room type. The developer plans to build two towers, each tower consists of 1000 units. The investment value of the project reaches Rp 1 trillion with a construction period of about four years. "We built one tower, if the market absorption will be good we build the second tower," said Rizzky. Under the plan, the position of the apartment will be above the trade center that is part of the project. In addition, at the site earlier development also built a number of shophouses. The plan of developers and PTPP as the main contractor of the project will sign a cooperation agreement in January 2018. Furthermore developers will hold a selection of units to the buyer in March - April 2018. The groundbreaking event is scheduled in June 2018. People interested in owning this apartment unit can now order it now, and the developer provides a special price of Rp 199 million for the first 300 buyers. This promise by Rizzky is only valid before the signing of the MoU with the main contractor in January 2018. Price promo was according to Rizzky offered on the studio type unit. While for the type of two rooms offered with starting price of Rp 399 million. Even so Rizzky guarantee, after the promo period, interested consumers can get an apartment unit at a price below Rp 300 million for the type of studio. Carrying a few advantages earlier, Midpoint Residence developers believe the projects on offer will be of interest to the public, especially the millennials and young executives. "This apartment is targeting millenial generation. Therefore we prepare the excellent facilities tailored to the needs of the target market, "said Marlene, Salas & Agent Coordinator Midpoint Residence. Marlene said the seven excellent facilities that are the mainstay of Midpoint Residence are children and adult pool, sky garden, jogging tract, multifunction room, access card, CCTV & security 24 hours, and smart living system. While the facilities provided for young people who became the target of this apartment include co-operative space, barbeque area, hot and cool poll, yoga room and coffee shop.